Keyword research is one of the most effective search engine optimization practices. 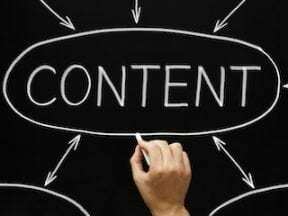 It can open the door to compelling content marketing ideas and link building. 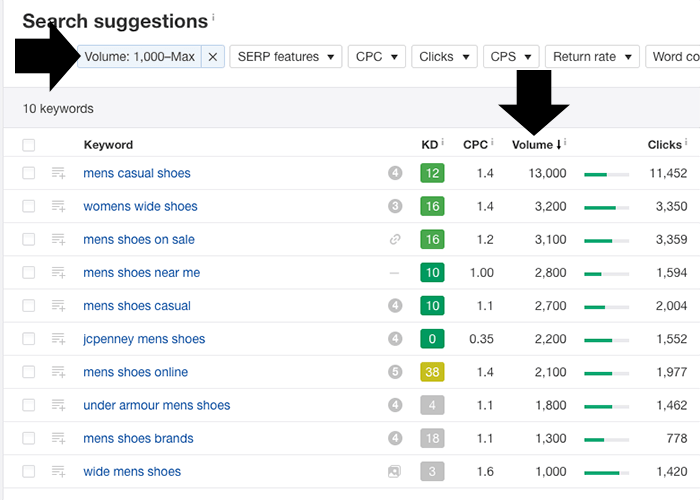 The so-called “niche down” method of keyword research starts with a single broad search term — for example, “men’s shoes” — and works its way down to niche keywords to target. 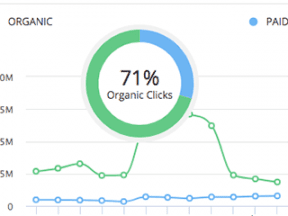 This is typically done with filters in a keyword research tool. Along the way, consider how much search volume a given keyword generates and how difficult it may be for your site to rank for it. In the end, you should have a list of niche keywords for content ideas — product descriptions, blog posts, and other forms of customer-attracting content. For our seed keyword phrase, we’ll use the aforementioned “men’s shoes.” It is a good retail example. We will take our seed phrase to a keyword examination tool. There are many good choices, including Ahrefs, SEMrush, Moz, and others. But for these examples, I will use Ahrefs’ Keyword Explorer. “Also rank for” keywords, which are phrases that the top 10 sites for “men’s shoes” also rank for. Ahrefs returns four categories of keyword ideas. These are a good place to start our niche-down keyword research. There are some good ideas here, such as “mens casual shoes.” So how do we decide which phrases to add to our list? Start with the search volume. In the case of Ahrefs, the volume metric describes how often a given keyword phrase is queried per month for a given country. A closely related measurement is “clicks.” While search volume considers the number of searches, the clicks metric estimates how many clicks from a search engine results page to a website happen as a result of those searches. It is worth mentioning that it is possible to have more clicks in a given month than there are searches. Let’s use a filter to consider only keyword phrases with at least 1,000 searches a month on average. After all, if we’re going to use this list of “niche down” keywords to develop content ideas, we want to make certain we have the opportunity to generate a reasonable amount of traffic. Filtering is a key step in niche-down keyword research. In this example, we only consider keyword phrases that meet a minimum search volume of 1,000. Ahrefs’ “having same terms” keyword ideas tool generated more than 148,000 possible keyword ideas. 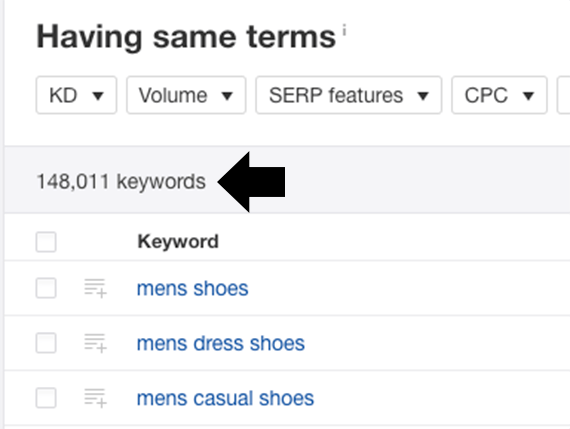 We will filter for search volume, only considering keyword phrases with more than 1,000 average monthly searches. Then we will also filter for keyword difficulty of 30 or less on a 100-point scale. This score is Ahrefs’ estimate of how difficult it will be for us to rank in the top 10 on a Google SERP for the given keyword phrase. Each keyword research tool will estimate difficulty differently. In this case, a keyword difficulty score of 30 means that a top 10 site will have about 36 referring domains linking to the target page. So, if we want to rank in the top 10 we can assume that we’re going to need to build more than 36 inbound links. Following the pattern described in the previous sections — starting with a seed keyword phrase and filtering for volume and keyword difficulty — it is possible to generate long lists of target keyword phrases. Your list, however, doesn’t do your business any good until you begin to optimize your site for those phrases, converting keywords into content. 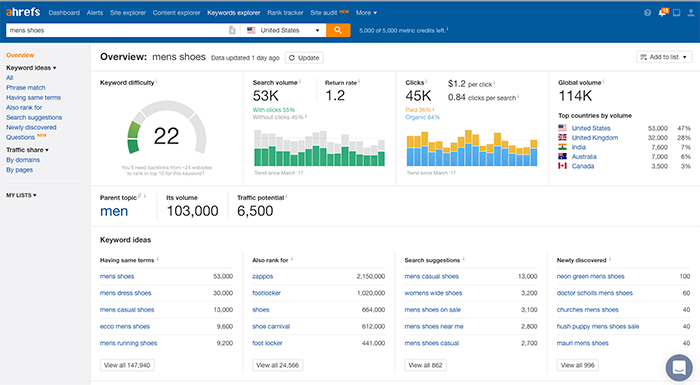 To demonstrate, we will use the keyword phrase “best shoes for standing all day mens.” According to Ahrefs, that phrase receives about 1,900 searches each month in the United States, resulting in some 2,092 clicks on average. The phrase also has a low keyword difficulty score of 5. Thus, it may be easy for us to rank for the phrase. Start by solving the problem. Potential customers who search for “best shoes for standing all day mens” are really asking a question about which shoes will keep their feet from hurting. So do a bit of research and learn what makes a shoe comfortable to stand in. If possible, ask suppliers, podiatrists, and occupational therapists. Link to these articles from your product detail pages, and include links back to your products in each post. These articles should also fuel an SEO link building campaign. With that, you’ve done it. You used a keyword research tool to move from a seed phrase to a few niche phrases, generating content ideas along the way.